Smart home systems like connected light bulbs that can be activated or scheduled from a smartphone app are a great example of why the concept of a smart home is an exciting one. However, those bulbs, and other connected devices, often communicate with your mobile device using wireless protocols like ZigBee and Z-Wave—not wi-fi. As a result, they each require a separate hub to integrate with your home network, and in turn, their own separate apps. Things get messy really fast, and it makes the idea of a connected smart home less appealing. 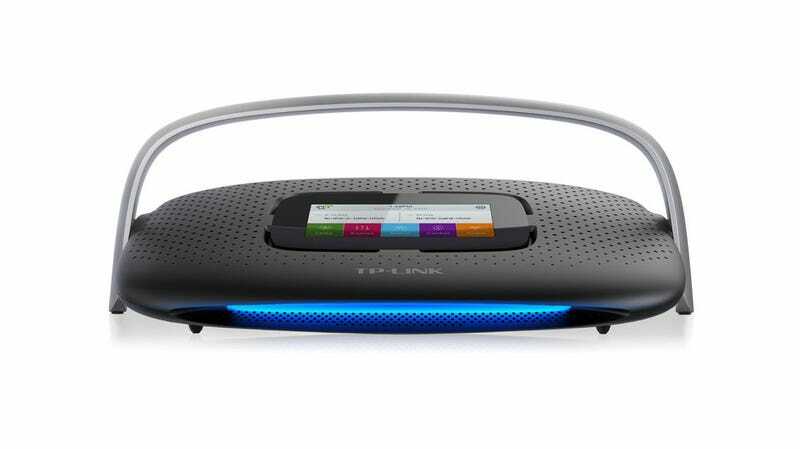 First and foremost the TP-Link SR20 is a well-appointed, 802.11a/b/g/n-compatible AC1900 router with support for 5GHz and 2.4GHz bands and speeds topping out at up to 1,300Mbps. Powered by a 1GHz dual-core processor the SR20 also boasts four gigabit ethernet ports, a generous 4.3-inch color touchscreen on top, and USB ports for attaching storage drives you want to make available on your network. But what makes TP-Link’s new SR20 really stand out is that it also natively supports the ZigBee and Z-Wave wireless standards. So instead of having to connect your Philips Hue lightbulbs to its own hub connected to one of your router’s ethernet ports, the SR20 can talk to them directly. Not only does it eliminate the need for a stack of smart home hubs sitting next to your wi-fi router, it also means you can control almost every connected device in your home from a single TP-Link app on your phone. Lights, security cameras, smoke detectors, and the endless flood of new smart home devices can all finally start to play nicely together. The SR20 even has an SD card slot so the router can record video from a connected security camera, and natively make that footage accessible to everything on your home wi-fi network. Having all of these wireless protocols supported by one box finally makes the prospect of managing an interconnected smart home a lot easier, and dare we say, far more appealing.